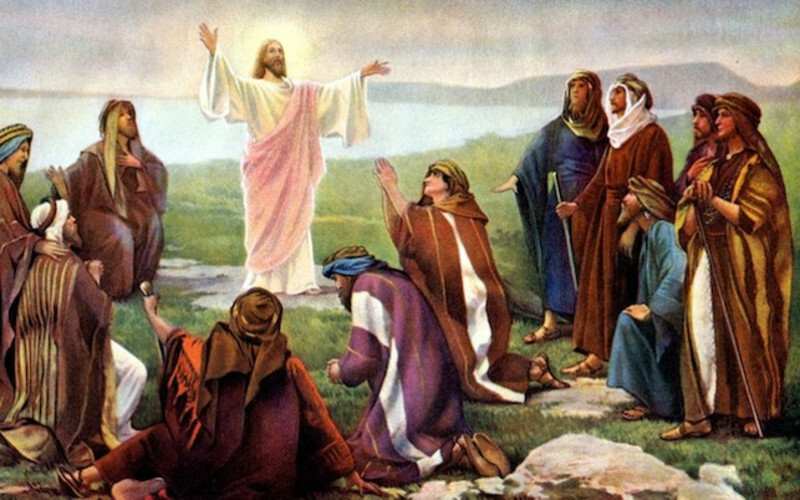 Today’s passage comes just after the first 12 disciples have been assembled by Jesus. This is the first real teaching in Luke’s gospel of the 12. Jesus wanted them to get the main focus of his teaching, the nature of their mission. This is similar to the officer training retreat we had back in early January. New deacons and elders that had been chosen by the Spirit through our nominating committee and congregation assembled together for initial instruction with me on a Saturday morning, and an overview of their ministry. That is in effect what Jesus did with the 12- an officers training. He didn’t give them the Book of Order, however, or go through a list of duties. He began with a description of the vision for God’s kingdom, or what many more progressive theologians call it, the kindom of God. Rev. Ginger Gaines- Cirelli, author of the book we studied last fall, Sacred Resistance wrote, “At our church, we often use the word kindom in place of kingdom to reflect gender-neutral view of God’s community, the kinship we share with all of humanity, and the belief that God’s vision for creation is about loving, mutual relationship.” This kinship we share with all humanity, the kindom of God was to be both a present reality worked for and a future hope. The structure of this teaching is centered on blessings and woes- point/ counterpoint. Point one-, Jesus said, “Blessed are the poor, for yours is the kindom of God.” Those who are poor are to be lifted up, fed, helped, recognized, valued, and loved, for the kindom of God belongs to them. Counterpoint- “But woe to you who are rich, for you, have already received your comfort.” How do these two opposing statements apply to us? First- “Blessed are the poor, for yours is the kindom of God.” For those of you who came to our Celebration of Ministry meeting on January 27, you may’ve noticed the table decorations. On most of the tables, there were paper origami flower arrangements. Those were made by a recent winter shelter resident named Wally, who now has a place to call home. Wally is trying to start up a business with these origami flowers, to help him reclaim his life and get back on his feet. Through buying those arrangements using church funds, we can glimpse what the kindom is to be like the kinship we share with people like Wally and the belief that God’s vision for creation is about a loving, mutual relationship. Finally, Jesus tells his disciples that the road ahead will be tough- following him will not bring about popularity, accolades or standing in human society, “Blessed are you when others hate you when they exclude and insult you and reject your name as evil because of the Son of Man. Rejoice on that day, because great is your reward in heaven.” He reminds them that those who had followed God before, the prophets, were treated similarly. He counters the blessing with the statement, “Woe to you who all people speak well of for the false prophets were spoken well of also.” Our goal as Christians isn’t to be popular, to be false prophets- to tell folks that the message of the gospel is to be prosperous and happy or to be well liked in society and not challenge those places in society that need to be turned upside-down. Again, Rev. Gaines-Cirelli wrote, “To be prophetic Christian witness is to correctly live, speak, believe and choose in ways counter to the dominant culture.” Our goal is to serve and follow Christ and to tell the truth of the gospel- to bring about a reversal of fortune, to lift up those who are poor, tear down the walls of oppression and challenge the status quo. It is to bring the message of the kindom-the kinship we share with all of humanity, and the belief that God’s vision for creation is about a loving, mutual relationship for the whole world. Bearing such a message will not win us any popularity contests. Jesus’ teachings continue to be scandalous and provocative because they overturn our conventional expectations. The sermon on the plain is a constant challenge to reorder our priorities in this life with a priority of working for the kindom. Jesus’ first teaching to the disciples calls us to take our discipleship seriously, to help bring about a reversal of fortune in this life, to help the poor not just because they are in need, but more importantly because they are highly exalted in God’s kindom. Jesus warns that we too will suffer- we will at times lack basic necessities and comforts; we too will feel the terrible sting of loss and mourning; we too will feel the rejection of others for following Christ. Yet in those moments God can mold and shape us, change our perspectives. So, like the first disciples who gathered, we modern-day disciples of Jesus have received our training for the day. May we go out from this place, and work to bring about God’s kindom, helping others in need, confident in both the highs and lows of this earthly life that God will sustain us, change us and is always with us. Alleluia! Amen.